TurboTax helps users tackle one of the most hated tasks: doing taxes. The tool is suited for users with little or no tax knowledge, or those who don't want to waste time on the mundane parts of life. From a simple questionnaire, TurboTax runs the numbers to figure out the best way to manage a user's taxes— with 100% accuracy guaranteed. It solves a need in a quick and easy way that users want. But because tax management is something you'd like to hastily brush off your plate, you'll want to spend as little time as possible on TurboTax, and not return until you have to. Although this is a signal of a job well done for TurboTax, it means they have to precisely time their requests for feedback and do what they can to make it count while they have the user's attention. When the user completes their taxes, they want to be 100% sure that the job has been done, because any mistake could have serious consequences. Understanding this, TurboTax first delivers clear and concise system feedback: The task confirmation is backed by the time and the date to provide the user with definite evidence of its completion. And anticipating user anxiety, TurboTax reassures the user that their conformational email is on the way. Uncertainty is dispelled, providing a well-rounded user experience. The moment of completion is a moment of relief and satisfaction: The burden of doing taxes has been taken care of. 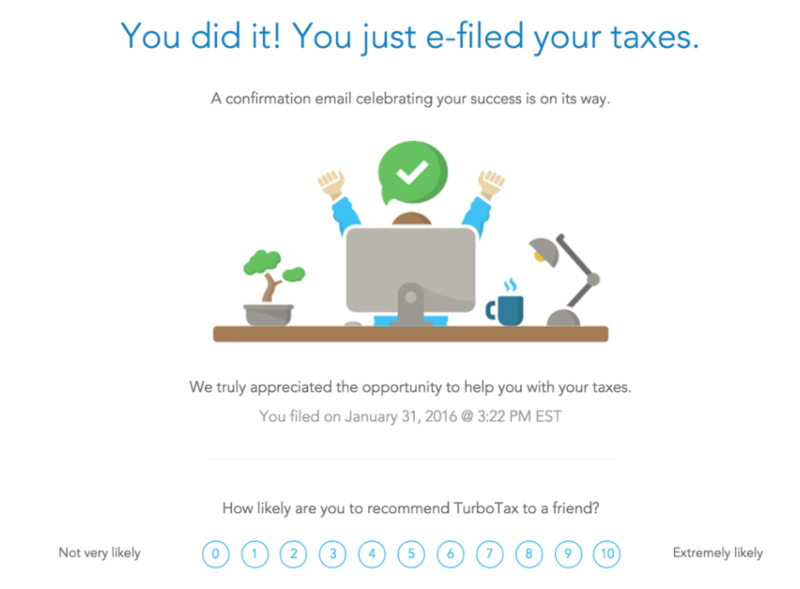 To amplify this feeling, TurboTax supports the moment with positive copy and a celebratory graphic. With all of the necessities out of the way, and the task fully complete, TurboTax makes the most of the moment to ask for the user's feedback. Using the NPS scale, with minimal barriers to participation, the user can provide accurate feedback because the experience is fresh in their mind. The question is asked in the right place, at the right time.